This book explains the typical objectives and processes that are involved in the creation and response to request for proposals (RFPs) for IP Telephony systems and services. It covers the key objectives for the RFP process, who is involved in the creation and management of the RFP, and how vendors are invited, evaluated, and notified of the RFP vendor selection result. Figure 1.6 shows the many requirements that are commonly considered when creating a request for proposal (RFP) for an IP Telephony system. 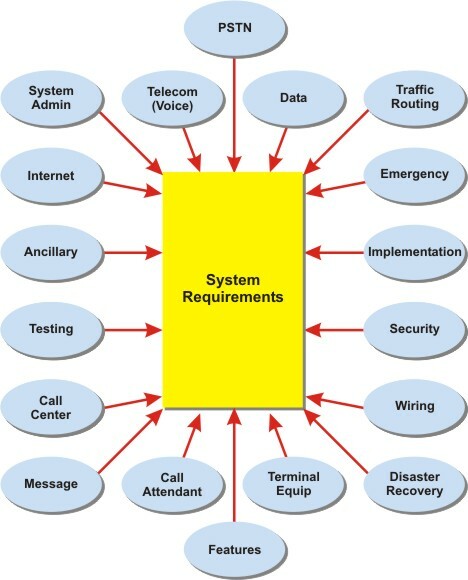 This diagram shows that some of the requirements include services such as telecom voice and data communication. The requirements also include installation, testing, and support requirements along with disaster recovery and security considerations.. Figure 1.7 shows that the creation of a request for proposal (RFP) document typically involves content and feedback from multiple departments within a company. 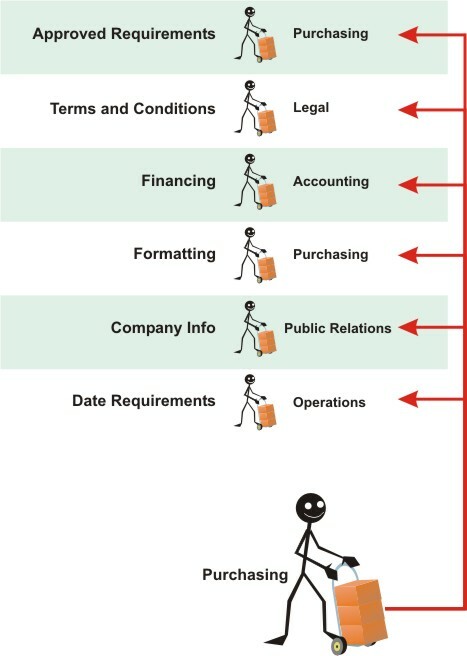 Approval and formatting requirements come from the purchasing department, terms and conditions from the legal department, financing terms from the accounting department, company background information from the public relations (PR) department, and critical date requirements from the operations (Ops) department. What are the Key IP Telephony System Requirements? Robert T. Floodhas had a distinguished 30-year career in the telecommunications industry. As a renowned speaker at forums around the globe, Robert is a noted authority on Internet Protocol (IP) telephony. Prior to co-founding PingTone Communications, a provider of managed IPT services to corporations and business users worldwide, Robert was the chief technology officer of Cable & Wireless Global, managing a $3 billion capital budget and 1,500 employees worldwide. Robert was previously the chief technology officer and senior vice president of engineering for ICG Communications, driving the Denver-based telecommunications company into 83 markets. At ICG Flood pioneered Voice over Internet Protocol (IP), covering 188 long distance markets within an 8-month period. Prior to that, he worked for CenTel for 19 years in senior engineering positions. Robert serves on the Board of Directors of several technology companies. He earned a bachelor’s degree in Economics from the University of Nebraska, completed the executive program at the J.L. Kellogg Graduate School of Management at Northwestern University, and has a master’s degree in Economics from the University of Nevada Las Vegas. You will learn what are RFPs and RFQs and why and when companies use and RFPs for IP Telephony Systems. Covered are the key objectives that RFP must satisfy along with the general creation processes used by most companies to create and manage the RFP process. Companies usually involve multiple departments in the creation of the RFP process to identify communication requirements for the entire company. You will discover who is involved in the Creation of an RFP and the typical steps performed during the creation of the RFP document.